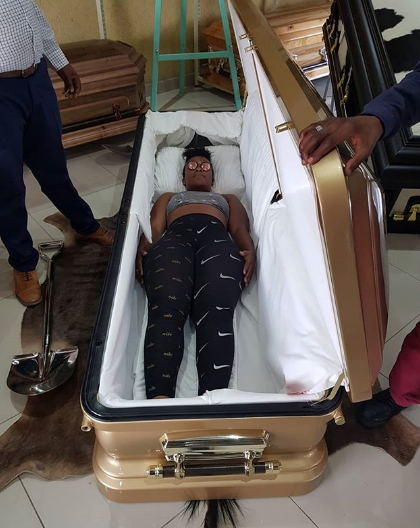 Wednesday, February 06, 2019- Scandalous South African socialite, Zodwa Wabantu, who is known for dancing pantless at events, has bought herself a casket worth Ksh 1 million in preparation for her funeral. While sharing the photos of herself posing in the casket, she said that she wants a befitting send off and doesn’t want to bother people when she dies. She wrote: “This is Taboo in Black Society. Black society is scared to talk about Death.